Many are confused about the difference between a regular chicken curry and Xacuti. 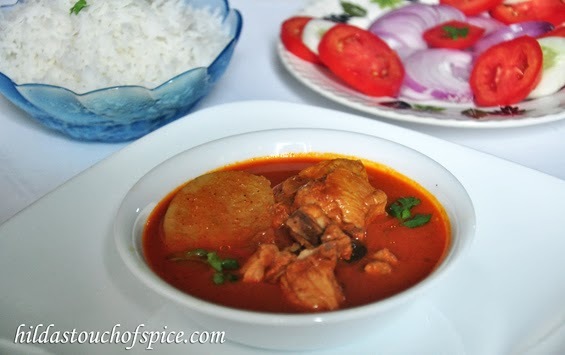 The Goan Chicken Xacuti is usually prepared for a Sunday meal or at celebratory occasions. To prepare Xacuti masala, the dry spices and coconut need to be first pan roasted and lightly toasted and then ground to a paste. In the normal chicken curry the spices are directly ground to a paste. 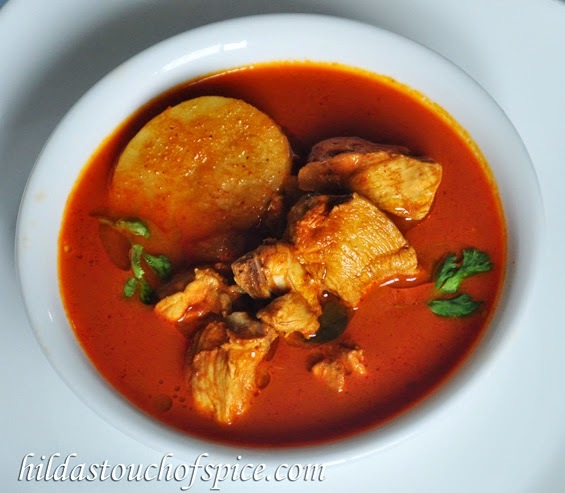 In most Goan homes you will find a Simple Red Chicken curry as this one. Each household may have their own combination and proportion of spices in their curry paste to make it unique and special. On a regular basis, my grandmother and my mum made it this way. We enjoy this curry every time I make it. We love the potatoes in the curry as they taste awesome in it. This curry tastes good even without potatoes. It tastes equally good with plain steamed rice, Goan bread or with Indian bread. We usually have it with rice, pao, broon, gutli pav, ladi pav or bread slices. Before I forget, I must tell you that this chicken curry improves in flavor and tastes better the next day! Marinate the washed chicken pieces with ginger-garlic paste and 1 tsp. salt for about 20 mins. Grind the below mentioned ingredients to a fine, smooth, thick paste with water. Transfer the spice/masala paste in a bowl. Rinse the blender/grinder jar with water & reserve for the curry. A large pinch – Nutmeg pwd. In a sufficiently large cooking pot/dekchi/clay pot, heat oil till hot. Reduce heat to medium. Add the chopped onions and sauté till soft and translucent. Add the marinated chicken pieces & sauté the pieces are lightly brown and cooked on the outside and the juices are sealed. Add the prepared spice/masala paste and gently mix to coat the chicken. Cook till rawness disappears and specks of oil separating from the masala. Add enough water depending on the thickness of the curry required. Give it a good stir and let it come to a boil. Drain & add potatoes, cover with a lid and let it come to a boil again. Reduce heat, cover with a lid and let it cook till the chicken and potatoes are cooked and tender. Keep checking at regular intervals if the chicken and potatoes have cooked through. Adjust salt to taste. Garnish with coriander leaves. Let the chicken curry rest for about 15 minutes for the flavors to meld. Before serving, re-heat if necessary. Serve on a bed of steamed rice or enjoy with your favorite Goan bread or with Indian bread. For a spicier curry, use chillies with seeds. Soaking chillies in water helps to blend better and quickly in the spice paste. You can use whole chicken cut into pieces or breast pieces with bone or even boneless pieces of chicken. In fact, any cut of chicken can be used. In Pune, special curry pieces are sold. Some prefer chicken with skin. You can include it as per your individual preference. For a perfect curry always maintain a balance in spices used. Excess or reduction of certain spices determines a well balanced flavor and texture of the curry. Always use water in moderation to maintain consistency of the curry. Remember, potatoes absorb water and thicken the curry. If using potatoes, adjust the water accordingly. Sauteeing is a very important process. It brings out the flavor from the aromatic spices used. Never over cook the chicken and potatoes. Chicken must be cooked and tender but should not fall off the bone and potatoes should not be mashed. If using tomatoes, adding a pinch of sugar cuts the acid. Besides, the curry gets a gloss. Try and prepare the curry a few hours in advance for the flavors to meld. Thank you for sharing this recipe. It was absolutely delicious and was lapped up in no time. This recipe is a keeper.